La Fortuna waterfall is probably the most well known waterfall in Costa Rica. This is most likely because it is located close to the tourist town of La Fortuna aka the gateway city for Arenal Volcano. In my opinion, Viento Fresco Waterfalls (and specifically the rainbow waterfall) are the most beautiful waterfalls in Costa Rica but that is of course completely subjective. Love waterfalls? 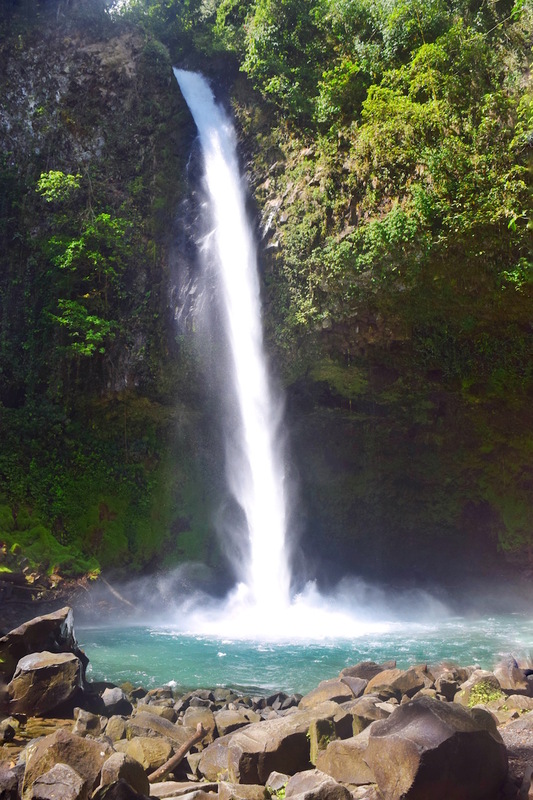 Check out my guide to the Best Waterfalls in Costa Rica. Driving to La Fortuna Waterfall is pretty easy if you have a rental car. I got there with my small standard car (no 4x4). From the main road that circles Lake Arenal (Route 142) you will see a huge sign in either direction for La Fortuna Waterfall. From there it is about a 5-minute drive. If you don't have a car there are many tour companies that will take you to the waterfall. Renting Tip: Personally, I traveled there (in the dry season) with a standard rental car. I didn’t rent a 4x4 because I was being cheap (extreme eye roll from me). Don’t be like me… Don’t be cheap, rent a 4x4 with 4 wheel drive. How much does La Fortuna Waterfall Cost? Admission to La Fortuna Waterfall is $10 per person. I am not sure about children prices. The waterfall is a great family destination; I saw many large families “hiking” the trail while I was there. There are bathrooms and a gift shop next to the ticket counter. Once inside the property there are another set of bathrooms and a small restaurant. There is also a small orchid garden that was lovely to walk through. Your first stop before the “hike” will be the viewing platform. The view is gorgeous! You can see it pictured to the right. From the platform are stairs leading down. This is why I wrote hike in quotations above, the hike is really a steep walk down professionally made stairs. Be aware that it is about 500 steps down. Not so bad when you are going down but pretty awful when you are coming up. Luckily, there are a bunch of benches and tables built right into the stairs for you to rest on the way back up. Once you make it down the 500 steps there are multiple platforms to view the waterfall. Most people find a spot on the rocks for their stuff and head into the pool. Do be aware that although there is a security guard, theft is high here. Also be very careful swimming, the waterfall is powerful and the current is very strong in the pool. If you have little ones or are not a strong swimmer there is also a calm river you can wade in next to the falls.